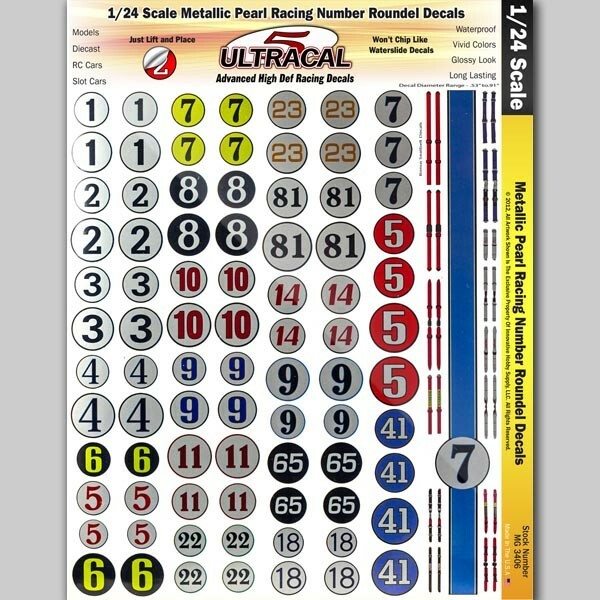 Ultracal High Definition Racing Decals - Metallic Pearl Racing Number Roundel decals designed for 1/24 scale slot cars, scale autos and more. These metallic pearl racing number decals feature an astounding metallic sheen that creates a stunning visual effect that is guaranteed to set your car apart from all the others! Ultracal decals feature extraordinary detail, vibrant colors, popular designs. Peel and stick application is easy to perform. Ultracal racing decals are highly resistant to scuffing, scratching, will not tear. They will maintain their beauty for years without the need to clear coat.